First, Evans’ perspective on continuous models and measurability issues is that those are only approximations of true models which can only be on finite sets. (I know this is also Keith’s perspective, so he should appreciate!) Any measure theoretic inconsistency like the Dickey-Savage paradox (central to Evans’ approach) can then be attributed to continuous features that vanish in the finite case. Easy does it! There is even an Appendix on “The definition of a density” following Rudin’s (1974) definition of densities as limits. And hence much more topological than the standard Lebesgue’s definition. Which makes those densities continuous for instance and avoid the selection of a “nice” version of the density. including this rather puzzling quote about Bayesian inference(s)—with which I cannot agree—Michael Evans defines his own version of evidence, namely the relative belief ratio that could also be called the Savage-Dickey ratio, being the ratio of the posterior over the prior density at a specific parameter value, and he expands on the various properties of this ratio. The estimator he advocates in association with this evidence is the maximum relative belief estimator, maximising the relative belief ratio, another type of MAP then. With the same drawbacks as the MAP depends on the dominating measure and is not associated with a loss function in the continuous case. Even in the finite case, the associated loss is an indicator function divided by the prior, which sounds highly counter-intuitive. A major surprise for me when reading the book is that Evans ends up with a solution [for assessing the strength of the evidence] that is [acknowledged to be] very close (or even equivalent) to Murray Aitkin’s integrated likelihood approach! An approach much discussed on the ‘Og. And in a Statistics and Risk Analysis paper with Andrew and Judith. Indeed, the strength of a relative belief ratio expressed as a ratio of marginals is a posterior p-value associated with this ratio. Which again has the drawbacks of not being defined a priori, of using the data twice, and of being defined on one model versus the other. Solving the Lindley-Jeffreys paradox—in the understanding of a clash between the Bayesian and frequentist answers—this way is then no major surprise, for this was one major argument in Murray Aitkin’s support of his approach (as seen for instance in the 1991 Read Paper). Pursuing this unique mix of Bayesian and extra-Bayesian principles, Evans also acknowledges a connection with Mayo and Spanos error–statistics philosophy of science and severity tests, although since he relies on a marginal likelihood for this purposes, this should clash with the authors’ arguments. Since the ratio is defined in terms of densities, the whole approach does not allow for improper priors. A fact acknowledged in the chapter on model and prior checking. Some of the criticisms are standard, including the marginalisation paradox and the impossibility to define marginal priors. Some less, as the above that the constraint of finiteness makes the prior data dependent (!) [no it should be imposed uniformly, excluding for instance Haldane’s prior] or the conclusion of that section that “it is not clear how to measure evidence in such a context.” (p.176) Looking at the bigger picture, this pessimistic conclusion is in line with (a) the global perspective adopted in the book that everything is finite, which leaves little room or use for infinite mass priors, and (b) the general difficulty in handling improper priors in testing. Although this was precisely the reason for Murray Aitkin to introduce his integrated likelihood paradigm, close to the current proposal (p.119). I was eagerly and obviously waiting for the model choice chapter, but it somewhat failed to materialise! Chapter 5 is about model and prior checking, a sort of meta-goodness of fit check, but as far as I can see, the relative belief ratio methodology does not extend to the comparison of non-embedded models. The part on model checking is very limited and involves computing a p-value for the likelihood of a “discrepancy” statistic, conditional on the minimal sufficient statistic. Why minimal sufficient? Because otherwise the p-value would depend on the unknown parameter, or the discrepancy would have to be chosen ancillary. Which requires a certain degree of understanding about the model and excludes reasonably complex models, unless one uses only rank statistics or the like, which cannot be good for efficiency. I think the criticism therein about posterior checks rather unfortunate, because using the predictive has the strong appeal to (a) bypassing the dependence on the unknown parameter and (b) avoiding adhoqueries like the choice of discrepancies. I also have a general difficulty with using ancillaries and sufficient statistics because, even when they are non-trivial and well-identified, they remain a characteristic of the model: using those to check the model thus sounds fraught with danger. The second part on prior checking is quite original and challenging. While the above quote is somewhat imbalanced in its use of religious terms like sanctity and beliefs (! ), I tend to concur with the idea that priors can be checked and compared. This is for instance the role of Bayesian robustness. Or of Bayes factors. Here, the way to identify prior-data conflict in practice and the consequence of a rejection of the prior remain vague, as it seems hard to avoid the data influencing the modification of the prior (besides the obvious, namely that identifying conflict leads to a modification). The only reasonable way is to set both a collection or family of priors and a modus vivendi for changing the prior, before the checking is done. But even then, assessing the coherence of the resulting construction is a huge question mark… There is however little incentive in using a marginal p-value (m-value?) especially when several priors are under comparison, since it requires to define a reference or preference prior. Or would it relate to a baseline model in the spirit of the revolutionary proposal of Simpson et al? 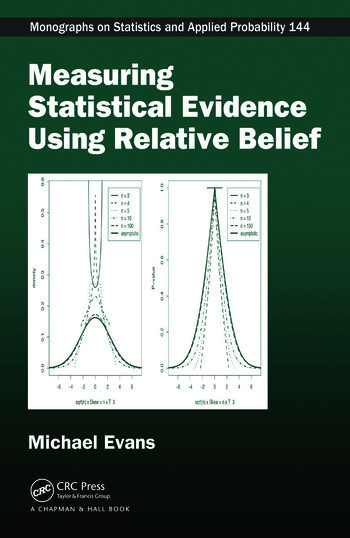 Overall, and even though I would not advocate this approach to evidence, I find Michael Evans’ Measuring statistical evidence using relative belief a fascinating book, in that it defines a coherent and original approach to the vexing question of assessing and measuring evidence in a statistical problem. And spells out most vividly the issue of prior checking. As clear from the above, I somehow find the approach lacking in several foundational and methodological aspects, maybe the most strident one being that the approach is burdened with a number of arbitrary choices, lacking the unitarian feeling associated with a regular Bayesian decisional approach. I also wonder at the scaling features of the method, namely how it can cope with high dimensional or otherwise complex models, without going all the way to ask for an ABC version! In conclusion, the book is a great opportunity to discuss this approach and to oppose it to potential alternatives, hopefully generating incoming papers and talks. This entry was posted on July 22, 2015 at 12:15 am and is filed under Books, Statistics, University life with tags ABC, Bayes factor, CHANCE, CRC Press, discrepancies, Error and Inference, improper prior, integrated likelihood, Jeffreys-Lindley paradox, Likelihood Principle, marginalisation paradoxes, model checking, model validation, Monty Hall problem, Murray Aitkin, p-value, point null hypotheses, relative belief ratio, University of Toronto. You can follow any responses to this entry through the RSS 2.0 feed. You can leave a response, or trackback from your own site. These matters need lots of discussion. Xian: It is clear that you are mixed in your evaluation of Evans’ book but perhaps not clear enough for many readers on where/what you agree or disagree with. > avoid the selection of a “nice” version of the density. Are you agreeing or disagreeing with Evans derivations from Rudin? Aitkin uses profile likelihood for marginalization (i.e. H-likelihood) so it is different. It is not a MAP and has different properties e.g. invariance to reparameterizations. OK, but Evans specifically avoids loss functions and decision theory stating that they can’t be empirical checked – “given the need of empirically checking every aspect of those analyses”. I don’t think he would object to subsequently choosing a loss function. It is a long book with I believe much depth, but I am biased and perhaps should end with an encouragement for editing for further clarity of your position. All of that is instantly Bayesian since it’s derived from the sum/product rules like Bayes Theorem. Anyone who objects to it for any reason is violating the most basic, widely accepted, and widely used equations in probability theory. I cannot comment much of substance here, nor claim I understand much of the post above, since I am just partway into Evans book. I find it fascinating, however, and the discussion above makes me want to consider things again, in another way, carefully. I knew nothing about Evans book apart from something commented here on the ‘Og, and for that I’m very grateful. So far, however, what has really interested me in the idea of taking ratios of probabilities w.r.t. the prior is that it is an operation similar to taking ratios of an index of the information content of the probability densities. In particular, I keep wanting to take the log of such a ratio and try to relate it to relative information or to some information criterion. After all, the prior could be accepted as a model of the parameter space which ignores data. A good model will be better than the prior. A bad model won’t. One reason, in my view, why Uniform priors are unhelpful is that they are maximally uninformative. Anyway, I need to work through the book and then see if there’s any mathematical flesh on these thin bones.